We left Florida on 4/18 and drove 5 days to get to to Grand Marais, Minnesota. The trip became increasingly expensive as the price of diesel fuel kept raising. 1800 miles at 10 MPG is a lot of fuel. The RV started acting up 3 days into the trip. It's been a recurring problem that never happens at the repair shop so it never gets fixed. This time I had a new computer program monitoring the engine when it started and I think I found the problem. It was a broken wire somewhere between the temperature sensor on the engine and the computer under the dash. I spliced in a new wire and everything has been normal since then. Hopefully it is finally fixed!!! We arrived in Grand Marais before the tourist season officially began on May 1st. We were the only RV in the campground. 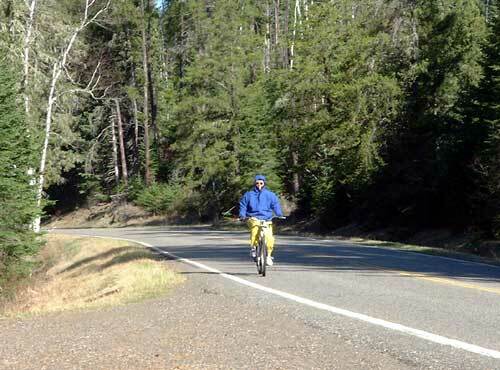 Judy began biking the sections of trail that she had not done last year. 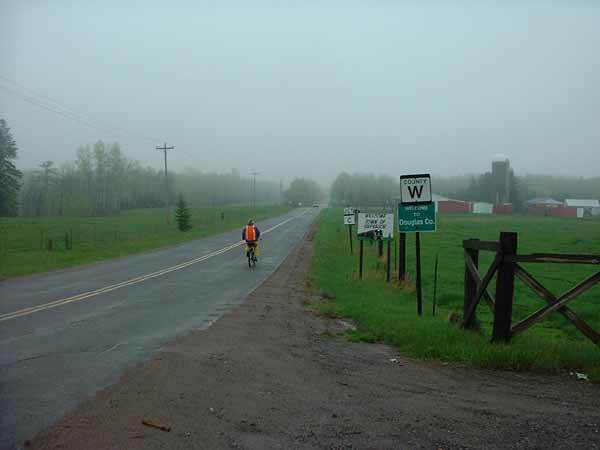 Since the Border Route Trail is reported to be in such bad shape she biked a parallel path on the Gunflint Trail and other back roads instead. 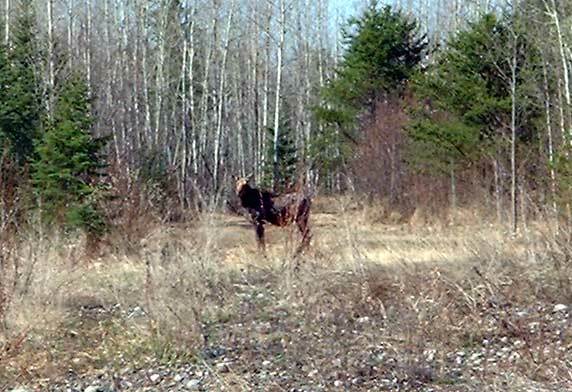 After dropping her off one day I sighted a moose in a field next to the road. It had been warm there and the wind was blowing over the lake. This made it so foggy that we couldn't see the lake from 200 feet away. A few days later John and Jane Canfield arrived and brought cold weather with them. We had no more fog but the wind blowing off of the cold water made it biting cold. A couple of miles from the shore it was warm. 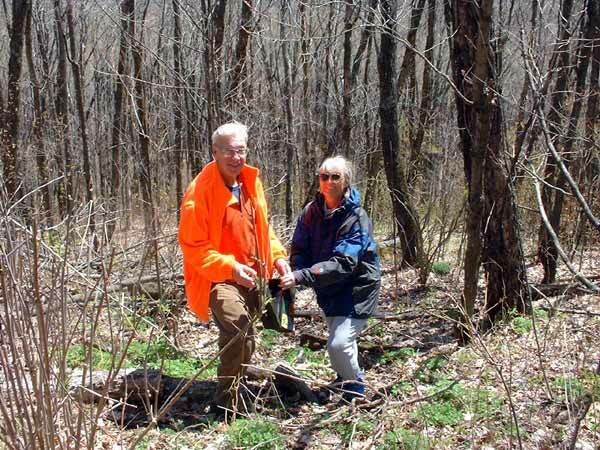 While Judy biked John, Jane and I would geocache. ( for more info go to www.geocaching.com) Jane saved John from stepping in the "moose manure". It was everywhere. 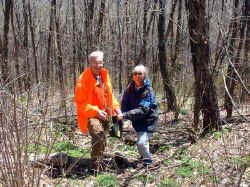 After Judy finished her biking she joined in the hunting for more caches. The scenery in this area is great. This waterfall is on the Canadian border at the Grand Portage State Park. Canada is on the right and the U.S. is on the left. We drove 40 miles to visit this park and the Grand Portage National Monument but the National Monument wasn't open for the season yet. All we could do was stand outside and read the signs. 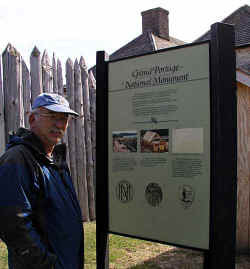 John and Jane left to go back to Winnebago to complete the repairs that they had started before they arrived here and to continue on their westward travels. Jerry Groebe arrived a few days later to hike with Judy. They had planned to do a 4 day full pack of the 38 mile Kekekabic Trail. 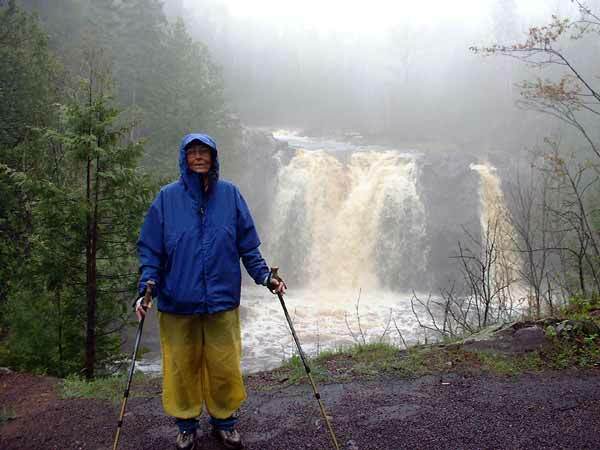 This would be the last section of the North Country Trail in Minnesota. 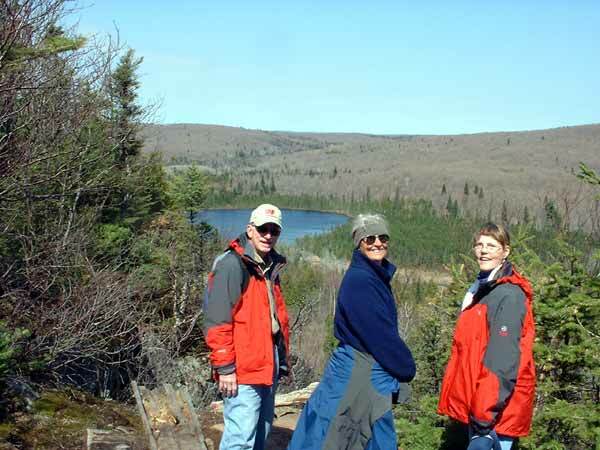 It goes through the Boundary Waters Wilderness Area and there are no roads in the area. No motors of any kind are allowed in the area so that chainsaws cannot even be used for maintenance. 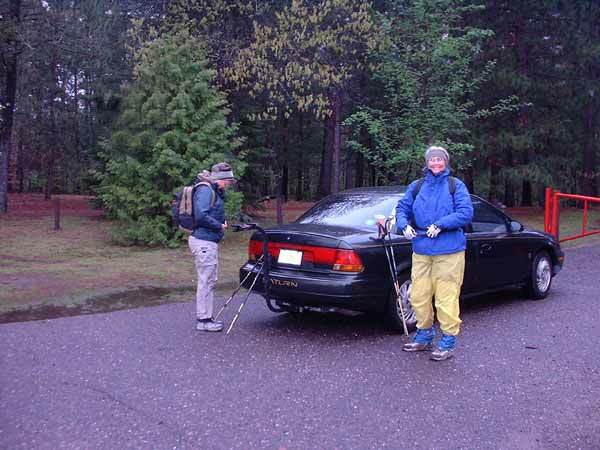 I dropped them off on the east end along the Gunflint Trail and was to pick them up 4 days later outside of Ely, Mn. While it was 38 miles to hike, I had to drive 180 miles around to get to the other end. The trail was in pretty good shape except for a few winter blow-downs. Jerry got to practice his army crawl. 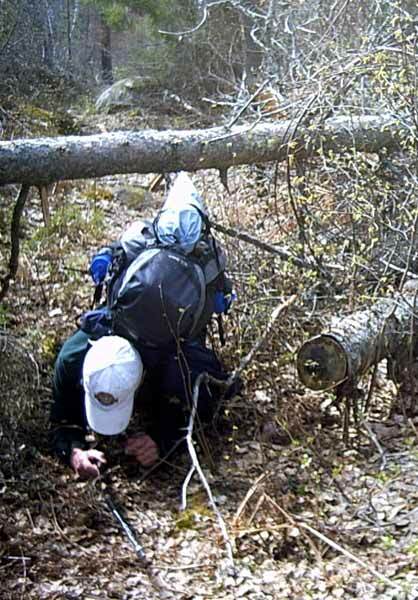 They were hiking a few days before the work crews were scheduled. They did have a nice camping area next to a lake to pitch their tents. Jerry however was not feeling well and didn't think he could make it the entire way. They decided to turn back and hiked back out to where they started. There was a canoe resort about a mile down the road where they phoned me to pick them up. 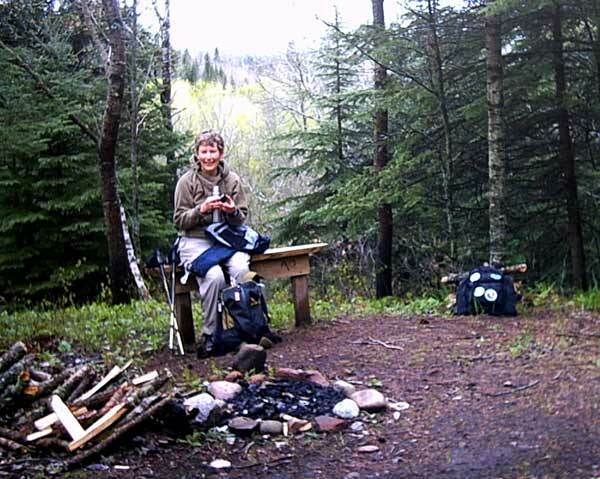 We decided to do some more geocaching and day hiking around Grand Marais and then move on to Wisconsin and begin where Judy stopped at the border last year. 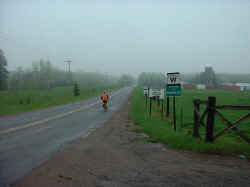 The weather however did not cooperate and it started raining every day. The forecast was for the rain to last for days so Jerry gave up and decided to go home early and possibly return when we got to Michigan. 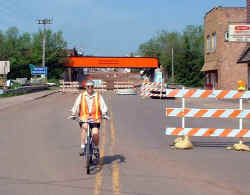 Judy biked from the WI/MN border to Solon Springs, WI. This is called a connecter route and is not really a trail but is a road walk. 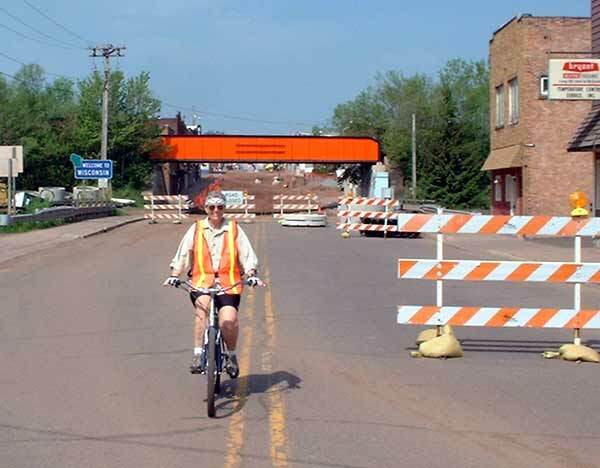 Why walk when biking is faster? You can see from the picture that is was foggy and damp and it would drizzle rain enough to get her glasses wet so she would have to remove them. 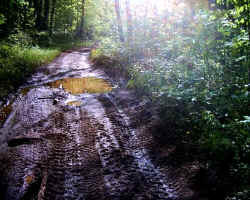 Along the way there is a short section of real trail through Pattison State Park. 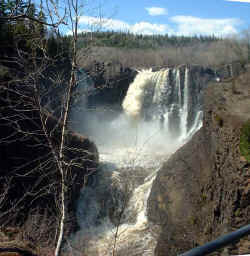 There are a couple of nice waterfalls there. We rushed to see them since the State of Wisconsin has a strange fee structure. It's $3/ hour or $10/day to visit their parks. A yearly pass is $35 for out of state residents. Since we were only going thru 2 parks we didn't buy a yearly pass and just paid $3 to see the falls. Because of the higher fees and reservation charges we didn't camp at any state parks in Wisconsin. 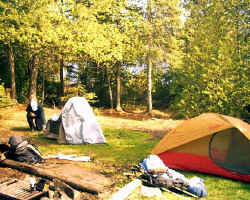 Commercial and local (city and county) campgrounds were cheaper and had better facilities. We stayed at a nice resort in Iron River called the 'Top O' the Morn' for the first 10 days. 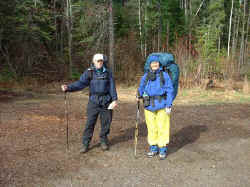 John and Adele arrived on 5/13 and the girls started hiking the next day. They started at Solon Springs. The trail goes thru the Brule River State Forest. This section of the trail was Judy's favorite. The Trail was well maintained and well marked. They even had benches for breaks and snacks. The only bad things were the ticks and mosquitoes. Long sleeves, long pants and DEET were necessary. We moved to the city campground in Ashland on 5/18. It's on a bay of Lake Superior. At one time it was the largest inland port in the world. Iron ore and lumber were the big shipments. That's all gone today. We had the whole campground to ourselves for the first few days. Even Memorial weekend was only half full. The only dock out of 12 that were here in the early 1900's is the worlds largest concrete ore dock next to the campground. It's 1800' long and 80' high. It was completed in 1925. Rail cars were pushed out on the top and the ore was dumped into hoppers below the tracks. Chutes were lowered over the ships and the ore dumped into the hold. Each one of the chutes in the picture (150 of them) has a hopper that holds 60,000 ton of ore. The last time it was used was 1965. It's now in bad shape and they are investigating what to do with it. One plan is to turn it into a maritime museum. The estimate to tear it down is $25 million. 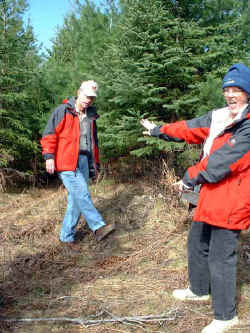 The railroad still owns it but wants the city to buy it for $1 but they aren't biting . John and Adele had a family emergency and returned home on 5/26. 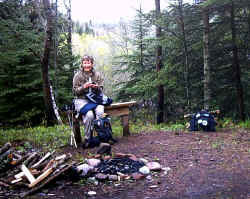 Judy continued on hiking. The trail got worse as she approached Michigan. 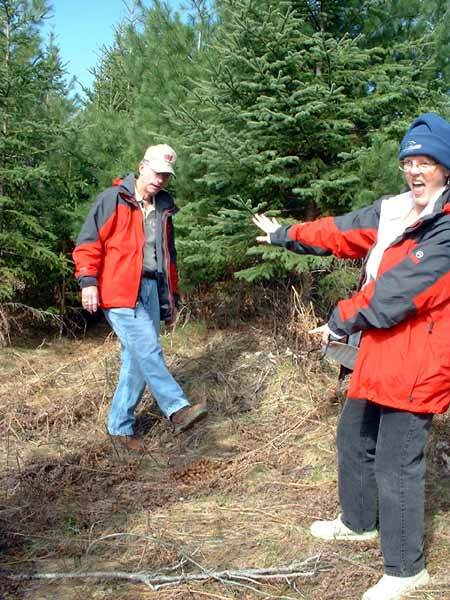 There are sections that have not been completed and others that are on ski trails or ATV trails. Ski trails are not groomed for hiking and these were overgrown and not marked well. ATV trails are extremely muddy. The last day she was lucky she biked on the road rather than take the ATV trail. There was a rally and there were hundreds of ATV's out on the trail. She would have either been run over or covered in splashed mud. There were even ATV washes set up to blast off the mud. The motel and bar parking lots were full of ATV's. I guess the activities of the day were sleeping, drinking and riding. She crossed the border into Michigan on 5/28. Of course the last two blocks of the road at the border were under construction. Luckily it was Sunday and no one was working. She biked right down the middle of it.